Utilize your vehicle's battery to efficiently power appliances, small electronics and office equipment on the road. Continuously supplies up to 700W of 120V AC power to 3 AC outlets from any 12V battery. Featuring an ultra-compact, lightweight design with metal housing, the PV700HF is the most rugged inverter available.NOTE: To protect against high current draw that may occur during inverter failure, a fuse link rated at 125a should be positioned no more than 18" from the PV700HF's battery in the positive line. The PV700HF PowerVerter® Ultra-Compact Inverter powers the equipment you commonly use at home or work—power tools, portable lighting, notebook computers—and puts it wherever life takes you. It’s the ideal power solution for RVs, commercial and fleet vehicles, emergency vehicles, remote sites and any other application that requires a clean, quiet AC power source. 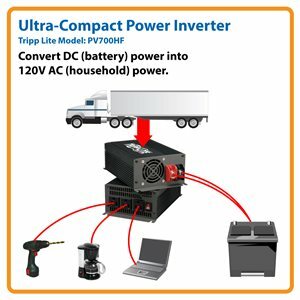 The PV700HF efficiently converts DC (battery) power into computer-grade 120V AC (household) power to power appliances, small electronics and office equipment while out on the road. And unlike portable generators, the PV700HF requires no fuel and produces no noise or fumes. With its 700 watt continuous output capacity and three AC outlets, this inverter can power multiple electronic items with ease. To prevent damage to the inverter and connected equipment, the PV700HF will shut down automatically if an overload is detected at the inverter outlets. The automatic low-battery shutdown alarm feature ensures you’ll always have sufficient battery power available to start your vehicle. Power appliances and other AC electronics on the road with your vehicle’s battery. The PV700HF features an all-metal housing that’s built to withstand vibration and impact—ideal for remote worksites, in trucks, RVs and other vehicles, on boats or anywhere that reliable AC power is needed. Its aluminum grooved surface promotes more efficient cooling and prolongs service life. The PV700HF features integrated mounting slots for permanent installation on any rigid, horizontal surface, such as the bed of a pickup truck. Connecting the PV700HF to your battery system is quick and easy with readily available user-supplied cables. AC power is provided to connected equipment via three AC receptacles on the front of the unit. The PV700HF is backed by a one-year warranty and manufactured in compliance with strict RoHS specifications.